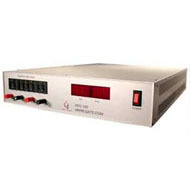 The HFC-100™ is a high heat flux chip simulator capable of measuring and controlling the amount of heat in a resistive element. The HFC-100™ comes with a chip simulator capable of dissipating 1k /cm2. The design of the heater block insures minimal heat loss to the ambient, hence, a more accurate thermal resistance determination of either heat sinks or cold plates. The system is capable of transient steady-state measurements and transient measurements. This system features ATS proprietary fluxSTAGE™, a LabView™ application, which automates the use of the system and allows the user to choose multiple heat loads at a specific dwell time. The program calculates the thermal resistance of the cold plate for desired cooling of the die and measures the simulated junction temperature. The HFC-100™ communicates to a PC via USB port and can accommodate up to eight thermocouple sensors for precise temperature measurement. The system automatically shuts off if the heater rises above the user defined protocol. To power the fan or the fan tray, an external power supply is required with its minimum voltage and current equal to the fan or fan tray power requirements.